This is week 15 of my ultra marathon training. It's so hard to believe I only have 10 weeks left! It'll be here before I know it. I am SO excited. I feel like as much as I'm training physically for it, I'm also mentally preparing for it. It's still hard to fathom running for 30 hours straight. But I have no doubt that I'm going to do it. It's not even a question in my mind. In 4 weeks I'll be going to the same trail and will run 50 miles on it. That'll be good preparation! Below is a pic of my training plan. As you can see, I'm not getting in as much mileage as I should be. That is not good. But I'm going to keep trying! A friend of mine gave me this book, and I am now reading through it for the 3rd time! 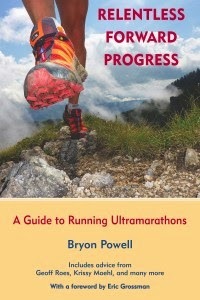 Relentless, Forward Progress, by Bryon Powell. It is SO good. Saturday I ran 14 miles on my treadmill. Hopefully the last long run on that thing! This weekend is supposed to be nice and warm, perfect to run 31 miles. Last night's 3 mile run outside was amazing! It sure felt good to be outside again. Remember this. 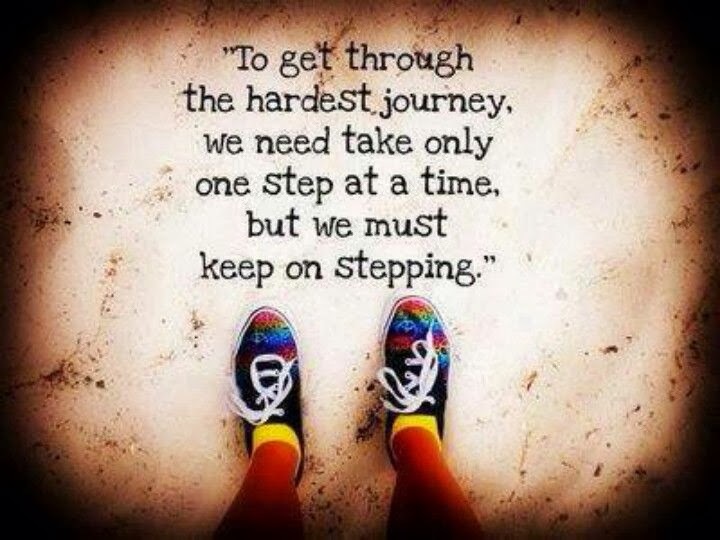 No matter how hard it gets, just take one step at a time, one day at a time. Just keep on going. Good luck with the rest of your training! I can't wait to read your 100 mile race recap! Wow! All the best for all your runs! I so look up to you! What I talk about when I talk about running is my favorite running book. I haven't heard of that one. I'll look for it. Thanks Liz! I really liked Chi Running =) Good luck on your training! I've heard of that! I really need to check it out. Thanks Betsy! I love that book too. I read it before I did my first ultra (50k). Keep moving and I hope the rest of your training goes well! It is an excellent book, I've learned so much! Thanks girl! I've actually never read a book on running. #fail I can't believe you're already halfway through your training. It will be here before you know it, for sure. I'll be running a Ragnar that same weekend, so I'll be thinking of you when I'm running in the dark. this is seriously inspiring! I really want to get that book now! Have you ever done a post on shin splints? Thanks girl!! You should get it. No, I haven't. I had shin splints when I first started running- oh, the pain!! But they didn't last too long, and I never get them anymore. seeing your plan makes it so real!! I'm excited for you!! So excited about the Color Run! Thank you so much for the awesome giveaway! You are such an inspiration!! I've never seen that book, but it looks good. Have a great run this weekend! You're so welcome. Thank you so much Jen!! Your plan looks awesome. I am so excited for you. I wish you the best of luck. I think your mileage looks extremely low and I would be real concerned about a serious injury. Is there a lesser option for you on that day? There is a 50 mile option that day as well. But I'm doing the 100! I still have 10 weeks left, and I plan on picking it up and I know my 50 miler in 4 weeks will help too. Thanks Jill! I love Born to Run....and I'm still in awe of you running 100 miles....you go girl! Another book I need to read! Thanks Sue! I think it's awesome you are training to do this! Good luck with all the training and I can't wait to hear how it all goes!!! We had 1 warm day yesterday that reached 64!! Now we are supposed to be back in the low 20s and a few days in the teens! :( I can't wait to hear all about your 50 mile trial run! :) Girl, you've totally got 100 miles!! :) YAY you!! Thank you Z. That encouragement means so much! This is so amazing that you are doing this! I can not even begin to imagine how much discipline it takes to train for a 100 miler!